At one time Second Avenue was an operable street that ran west from North Webster Street to North Cedar Street. East of Webster it jogged to the north, dividing the Platt & Frees’ Lumberyard location from the W. N. Richardson property. Its closure is confirmed in the comparison of the 1897 Sanborn Fire Map to the 1905 map of the same series. The young Richardson family, “Newm,” Charlotte, and newborn daughter, Winnifred, were early Red Cloud residents. Richardson was one of the many “shakers and movers” who had great visions for the infant settlement. His hard work, humility, and dedication ensured that Red Cloud would develop into a town that stood out in pride, character, amenities, and forward-thinking citizens. The Richardson home which started as a one-room abode in the early 1870’s, was gradually expanded into the beautiful two story edifice we enjoy today. The local newspapers (five at one time) chronicled the home’s additions over the years. During the early 1880’s a Chinese immigrant family started a laundry in Red Cloud but the business was short-lived. 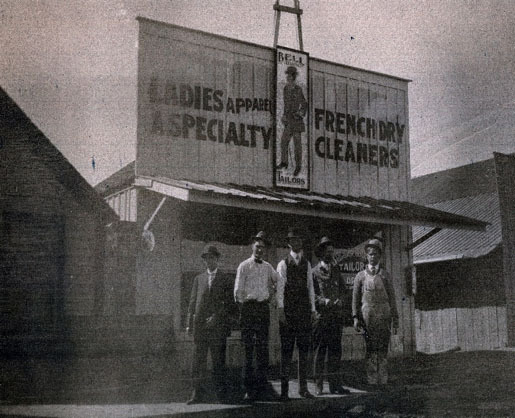 Other laundry venues, such as the French laundry facility pictured here and associated with the Bell Brothers’ Tailoring business also operated over the years. 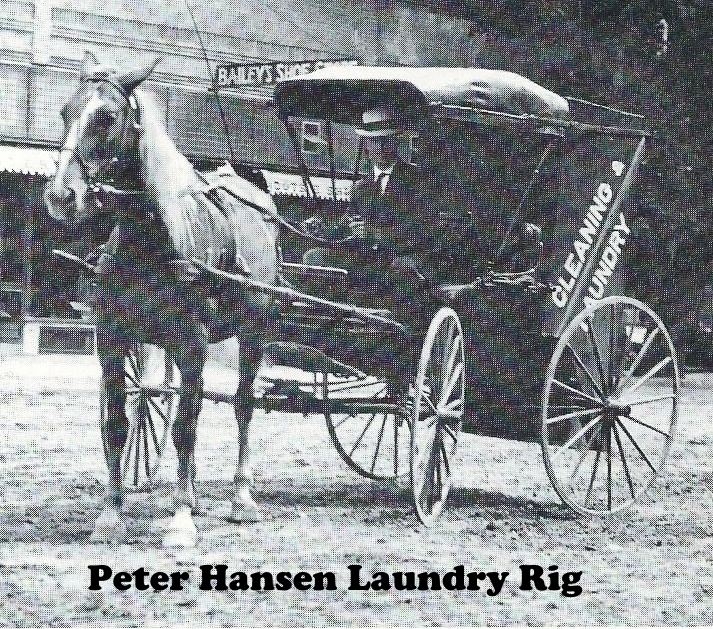 Peter Hansen, a Danish immigrant, was associated with the laundry business in Red Cloud for many years. The Hansen family and employees shown here ran a steam-operated facility. 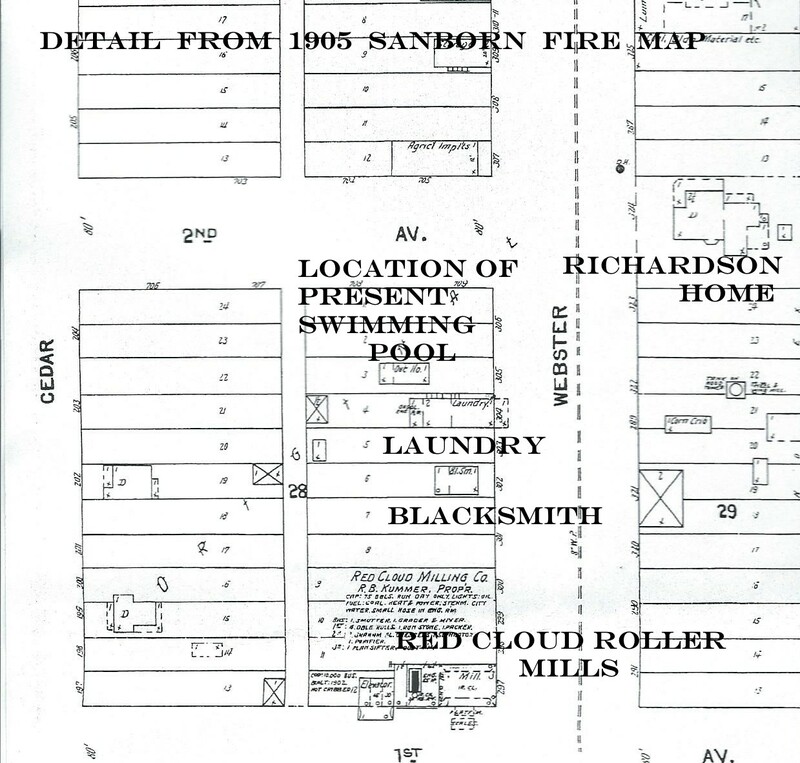 As shown on the map, this facility was located north of the blacksmith shop in the 100 block of North Webster Street. This was in close proximity to where the swimming pool is now located. However, Mr. Hansen wasn’t alone in his trade. As reported by citizens and confirmed in various census reports, many women provided extra income for their families by taking in laundry and working as washerwomen from their homes. Ladies and older girls would also “hire out” to help with such tasks. To help supplement their family incomes, some females also worked from their homes and took in ironing. Up until the advent of “no-iron/wrinkle-free” fabrics and until the practice of ironing garments such as undershirts was abandoned, this activity occurred in Red Cloud well into the late 1960’s and early 1970’s. Later, Peter Hansen operated his business in facilities west of the park in the 200 block of North Cedar Street. The Hansen Laundry was a complete service, as it picked up and delivered clothing, as well. The photo, dated sometime after 1911, shows Mr. Hansen on his laundry route in the 400 block of North Webster Street. Another laundry-related business was a dry-cleaning business owned by Dudley Lynch in the 1920’s. The business office was located in a room upstairs just north of the State Bank building in the 400 block of Webster Street. The actual cleaning was done in a shed located in the alley east of the high school in the 700 block of Webster. Accelerated by the chemicals used in the cleaning process, fire brought an end to this facility.